I can see why many visual artists dislike words in artworks. They feel that words dirty the clear water that has reflected the sky. It disturbs the pleasure of the silent image, the freedom from history, the beauty of nameless form. I want to name our pains. I want to keep our names. I know that neither images nor words can escape the drunkenness and longing caused by the turning world. Words and images drink the same wine. There is no purity to protect. The following series of art works explore the relationship between literature and visual image. Each of the pieces incorporates text and have taken their inspiration from quotations and poems that I have found particularly meaningful. 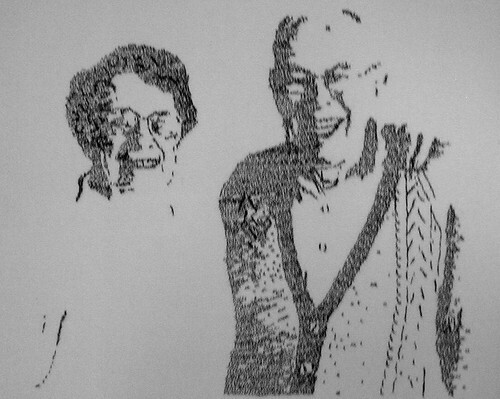 A Portrait of my Grandparents, made entirely of text using a computerised embroidery machine. Machine stitching on Calico. In each instant of their lives men die to that instant. It is not time that passes away from them, but they who recede from the constancy, the immutability of time, so that when afterwards they look back upon themselves it is not themselves they see, not even – as is customary to say – themselves as they formerly were, but strange ghosts made in their image, with whom they have no communication. The first verse of ‘If’ by Rudyard Kiping made from pebbles, on canvas. Created using handwritten text. Permanent marker on canvas.